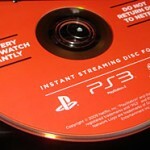 Just this week Netflix made available a special disc that allows its streaming movie service on Playstation 3 consoles. Once you get the disc (and it arrives usually next day after ordering), you insert the disc into the Playstation 3 to get an activation code. You then log-in to your Netflix account online and enter the code. HD content is hard to find through the PS3 interface. You have to scroll through every movie looking for the “HD” tag under the title. There are browsing categories by genre: Horror; Sci-Fi; Comedy; etc., but an “HD” tab would make things a lot easier. Online they’ve got it right, you simply choose to browse the HD category. Once you find a movie you want you can either play it instantly or add it to a download queue. That’s about it — a very simple interface. A Netflix account gives you three options for watching movies. The first, and what was the initial core of their business, is to order movies by mail. The second option is to watch streaming movies through your PS3, Xbox 360 or other enabled devices such as Blu-ray players and HDTVs. The third option is to watch the movies on your computer. First you have to install the Microsoft Silverlight plug-in, Microsoft’s newest solution for streaming video. There is no advertising in the stream, as you normally find watching premium video content online. Video quality online is not so hot as you might expect from streaming video. I previewed two recent movies on a MacBook Pro at both 1650×1050 and 1152×720 resolution and the sharpness and contrast had nothing on Blu-ray or broadcast HD. If you want better quality from a subscription service, Vudu’s downloadable HDX format gives much better quality at 1080p. Scrubbing through the Netflix Silverlight player is smooth with broadband. As you search along the timeline you get a preview of the current frame and frames before and after. Buffering is fairly quick no matter what place on the timeline you select. Netflix also streams on many other systems including xBox 360, the Roku player, LG HDTVs with NetCast, Tivo HD DVRs and certain Sony, Samsung, LG, Insignia, and LG Blu-ray players. Netflix is currently offering a free two-week trial which combines online, PS3 and disc-by-mail options.